« Fearless Fitness Weekly Update 4/17: Your Life On Healthy Habits. Live It. LOVE it. THE ICE BATH. Im not crazy . Just cold . My tub before the plunge... looking at this makes me COLD! ICE BATHS are crazy, wonderful inventions athletes and gym fanatics have incorporated it into their training for ages. It’s inevitable: if you swim, bike, run, or train at high intensities or for long durations of time the body is going to break down. The daily wear and tear adds up and before long lactic acid, achy muscles, and fatigue set in. You’re legs are tired, inflamed, and heavy. Unfortunately, intense training can increase your risk of injury, which can result in unplanned—and unwelcome—time off. One simple way to offset the risks inherent to long bouts of training is cold-water immersion therapy, a recovery technique we know as, ICE BATHS. According to RUNNERS WORLD, Cryotherapy (“cold therapy”) constricts blood vessels and decreases metabolic activity, which reduces swelling and tissue breakdown. Once the skin is no longer in contact with the cold source, the underlying tissues warm up, causing a return of faster blood flow, which helps return the byproducts of cellular breakdown to the lymph system for efficient recycling by the body. Not only do ice baths suppress inflammation, but they help to flush harmful metabolic debris out of your muscles. Though you could use individual ice packs, ice baths generally produce a greater and longer lasting change in deep tissues and are a more efficient means of cooling large groups of muscles simultaneously. The discomfort associated with sitting in a tub full of ice water scares off some athletes – but there are some ways to make sub 50 degrees tolerable. Though scientific research exists to support the use of ice baths to promote recovery, no exact protocol has been proven better than others. 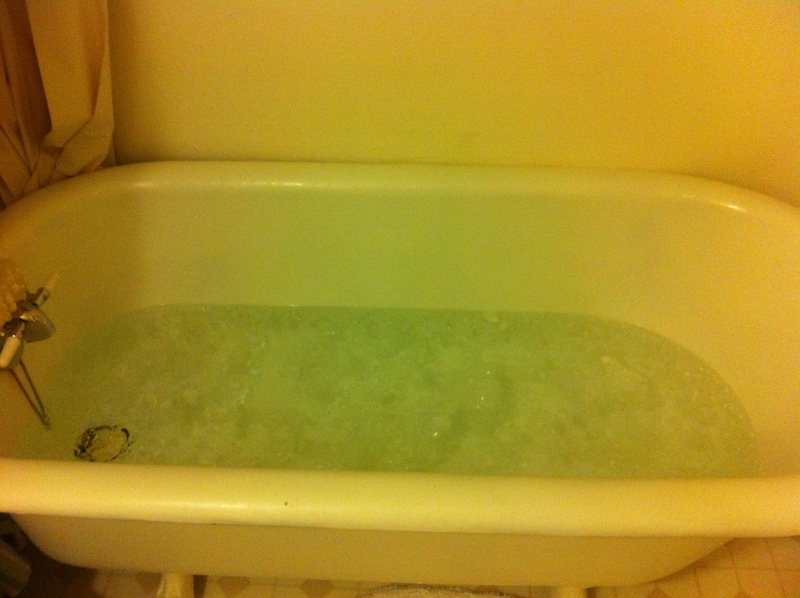 This is my personal ice bath routine…. modify yours to fit your needs. In general, water temperatures should be between 50 to 59 degrees Fahrenheit, and immersion time ranges from 10 to 20 minutes. Among athletes, there are ice bath techniques that vary within and on either side of these ranges. So grab a hoodie, some HOT tea, and JUMP IN. You’re legs will love you for it. 1. Fill the tub with cold water. 2. Put on a warm sweatshirt or swimsuit. I usually wear bikini bottoms with a thermal sweatshirt, but a full suit works too. 3. Get a hot cup of tea to keep you warm. Some of my friends get a glass of wine to keep them “hot”. 4. Use lots of ice. I buy a couple bags from walgreens and throw them ALL in. Toss ice in tub with cold water. 5. Allow the water to fill until its enough so that your legs can be completely submerged. 6. Take a deep breath. Jump In. 7. Distract yourself with a hot cup of tea, a movie, calling friends and chatting (my friends usually think Im crazy but Im SO glad to have them sit on the phone with me!). I try to stay for a minimum of 15 minutes. After a couple minutes your legs get numb and it’s really not that bad. I make sure to move my legs every so often so the water around them shifts. 8. Have an exit strategy. Plan ahead – Getting out of the ice bath can be tricky … you’ll end up walking around like a baby giraffe and wondering where your legs went. Have towels handy and be prepared to get out of the bath, towel off, and SIT until your legs return to reality. 9. Warm up! I try to wait before jumping into a hot shower so I dont losing the effects of the ice faster than need be (and BURNING my skin from the cold to hot temperature contrast!). I did just put myself through sitting in a tub of ice, why would I want to lose an ounce of the benefits? Distract yourself with movies, email, whatever for another 10 minutes or so. Then WARM UP with a hot shower. 10. Enjoy a good nights rest and wait a while before you take the plunge again! Do you take ice baths? What do you use them for? What are your tips to make them “more bearable”? Our running routine includes standing in the water at Little Marina Green after longer runs. And we try and stay in about 1 minute per mile run. I've found this a great post cooldown, post stretch routine. And it really does reduce the residual soreness from the run, and you save the $$ and time needed to buy the ice. Bring your ipod (but be careful of getting it wet) and/or just stare out at the bay while you're counting down your minutes to make the time go faster. so worth it! they would be eaiser with company though… they should be a post run ice tub that we can all jump in together! Okay, the thought that I can wear a sweatshirt on top makes it more appealng!! Probably a ski cap too. You need to try it – its a life changing experience!